This vegan pesto is made with cashew nuts and sundried tomatoes. sunflower oil, *sundried tomatoes* (15%), *cider vinegar , basil*, cashew nuts*, garlic puree*, salt, black pepper, pine nuts*. *denotes organically grown ingredient. As official Suma stockist in the UK, we sell quality Table Sauces to customers throughout the UK in England, Wales, Scotland and Northern-Ireland. Where to buy Suma Vegan Red Pesto safely online? 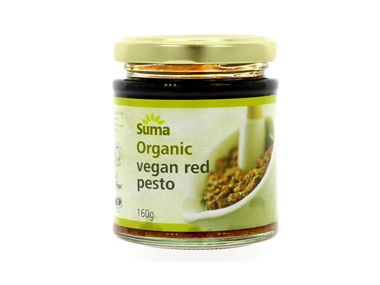 Shop at the Online Health Food Store if you are wondering where you can buy Suma Organic Vegan Red Pesto - 160g safely online in the United Kingdom. Our Health Shop is located in the UK and our award-winning independent has been serving customers in England, Wales, Scotland and Northern-Ireland since 1976. You can buy our Beans, pulses, grains, flours, seeds and dried fruit and other quality Table Sauces online and we post out orders to any UK address. Vegan Red Pesto - Suma Organic Vegan Red Pesto - 160g in Table Sauces and Table Sauces & Condiments.